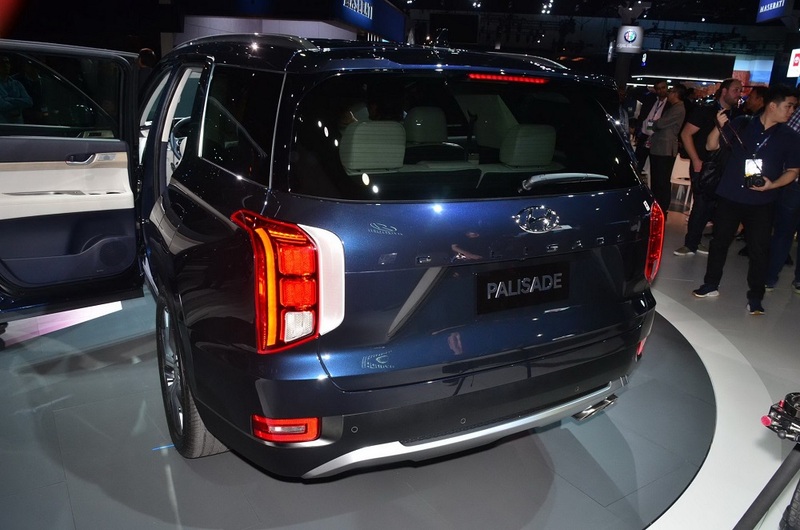 Hyundai has introduced its new flagship premium three-row Palisade SUV at the Los Angeles Auto Show. 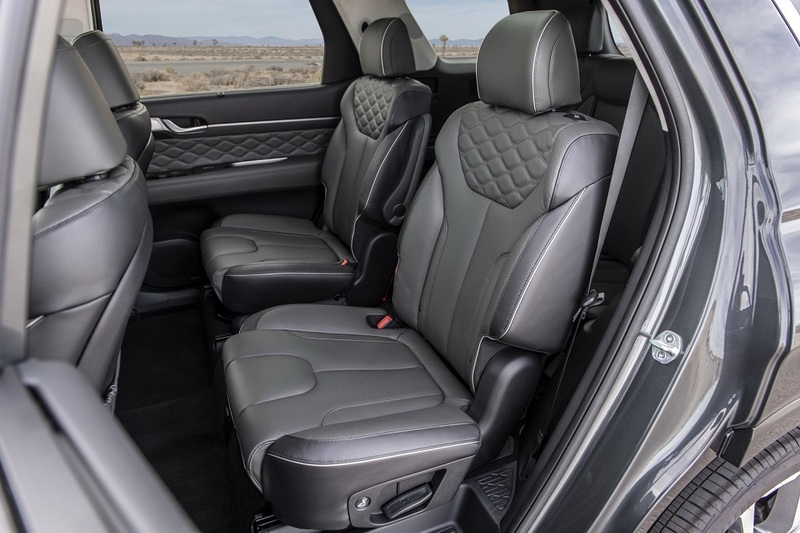 The 2020 Palisade rides on an all-new SUV chassis with exceptional second- and third-row roominess coupled with generous cargo area and reconfiguration flexibility. The Palisade’s styling conveys dignity with style in an understated theme that demonstrates clear differentiation worthy of a flagship SUV. From the front, a dominant, bold and wide cascading grille clearly represents a premium SUV. Separated composite headlamps and a vertically-connected forward lighting signature create a strong and distinctive front demeanor, with available LED headlights, LED daytime running lights and LED turn-signal mirrors. A powerful, extended hood profile creates an impressive road presence, while bold C-pillars and a panoramic glass side graphic convey generous third-row spaciousness. Full volume over-fenders and body sides offer muscular detailing. The rear view emphasizes a wide and stable stance via sinuous detailing and a vertical LED rear taillamp design. Panoramic rear glass coupled with a cutaway roof provides a generous sense of spaciousness to rear passengers. 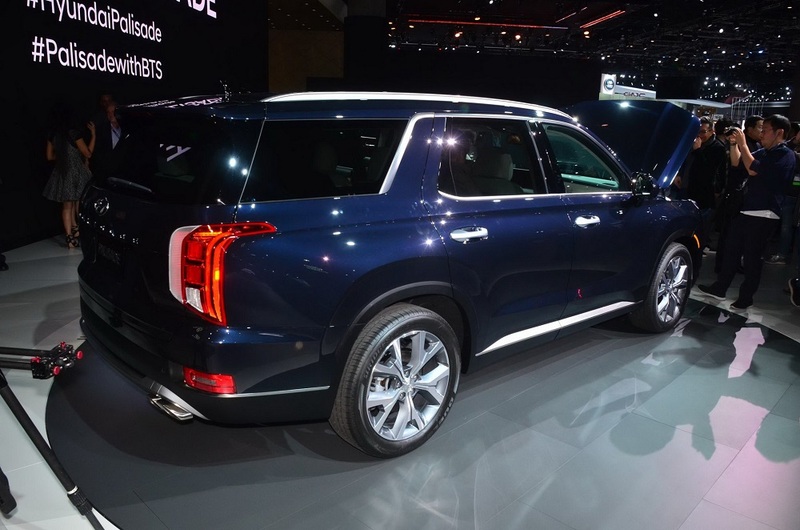 Available oversized 20-inch alloy wheels further fill out the Palisade flagship presence. This design has aerodynamic benefits as well, with a 0.33 Cd. Palisade achieves this low drag coefficient with specific design cues that include a fast A-pillar angle, a rear spoiler side garnish, an optimized front cooling area with an extended internal air guide, aero underside panels, and rear wheel aero deflectors. The Palisade also offers a class-exclusive Blind View Monitor that complements the standard Blind Spot Collision Avoidance Assist, which provides easy-to-see body-side views whenever the turn signal is activated. The audio and navigation display is a generous 10.25-inch touchscreen in widescreen format, coupled with a 12.3-inch fully-digital TFT center instrument cluster offering various view modes and differentiated drive mode illumination. Two Bluetooth devices can be connected simultaneously, with one for a mobile phone connection and the other for audio streaming. The single instrument panel gauge cluster integrated with navigation offers exceptional legibility and ease of use, coupled with an available head-up display feature. Center console innovations such as shift-by-wire controls free up valuable control space for the features drivers use most. The shift-by-wire system also includes automatic park logic that shifts the vehicle into park when the engine is off and the driver opens the door. The Palisade’s center console bridge design also frees up convenient storage space underneath the center console control area with driver and passenger access. The interior features seven available USB outlets, including front-seatback-based USB outlets for the second row occupants and mini-pockets for digital devices of all kinds. A generous 16 cupholders means there’s always a place to stow a beverage at any seating position. Seatbelt connection notification to the driver is active in every seating position. The Palisade offers abundant technology, including Hyundai’s latest navigation system with Android Auto and Apple CarPlay. To eliminate the need for a charging cord, there’s an available Qi wireless charging pad for compatible Android devices as well as recent Apple iPhones. When it comes to audio technology, the available premium sound system is well-suited to the Palisade’s upscale interior. The Infinity audio system features Clari-Fi and QuantumLogic Surround Sound technology. Clari-Fi works in real-time to rebuild audio details lost in digitally-compressed music, while QuantumLogic extracts signals from the original recording and redistributes them into an authentic, multidimensional soundstage for playback that is clear, refined and full of detail. The result is a more robust and enjoyable on-road listening experience. Taking inspiration from aircraft technology, the Palisade’s available Heads-Up Display (HUD) projects a virtual image onto the windshield, helping the driver to better keep his or her eyes on the road. The feature uses a system of mirrors combined with a full-color TFT LCD display and features adjustable brightness to ensure excellent daytime and nighttime visibility. Driving information such as speed, Smart Cruise Control status, navigation, Blind-Spot Collision Avoidance Assist, Forward Collision-Avoidance Assist, speed limits, Lane Following Assist and audio system data is projected at an ideal virtual distance for maximum legibility. The Palisade power comes from an Atkinson-cycle 3.8-liter V6, dual CVVT, direct-injected engine, for excellent power and efficiency. This powerplant produces an estimated 291 hp at 6,000 rpm and an estimated 262 lb.-ft. of torque at 5,000 rpm. It delivers that power to the wheels via an 8-speed automatic transmission with a multi-plate torque converter and offers both two-wheel and HTRAC four-wheel-drive configurations, with a final drive ratio of 3.648 for confident acceleration. The Palisade offers a number of advanced safety technologies standard, including Forward Collision-Avoidance Assist with Pedestrian Detection, Blind Spot Collision-Avoidance Assist, Lane Following Assist, Rear Cross-Traffic Collision Avoidance Assist, Safe Exit Assist, High Beam Assist, Driver Attention Warning and Smart Cruise Control with Stop and Go. 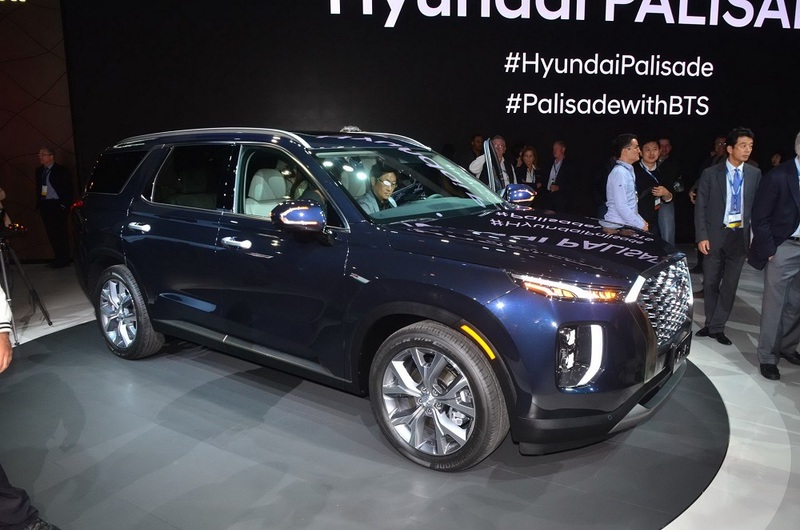 The 2020 Hyundai Palisade will be produced in Ulsan, Korea and will be available at dealerships across the U.S. in the summer of 2019.